Miranda jumps at any chance to explore a new country. She spent March of this year travelling solo in China, exploring her roots. Back home in the UK, she lives in Brighton and works in new business development for a learning disabilities charity. So Miranda, where did you go on your most recent adventure? I spent the month of March travelling around China on my own. It sounds like a long time but China is absolutely enormous. I only saw a small fraction of the country in that time. I based myself mainly in big cities and then did some brilliant day trips to villages, rice terraces and mountains in the surrounding areas. The main stop-off points were Hong Kong, Guangzhou, Guilin, Shanghai, Huangshan, Beijing, Pingyao and Xi’an. Then I went to Hainan Island for a few days of sunshine before coming home. Why did you decide to go travelling solo in China? I will take any opportunity I have to travel! In this case, I was feeling restless work-wise and had just finished a Masters degree. It was a treat to myself and an opportunity to think about what would come next. I’d already used up the one sabbatical that my company allowed, but I managed to wangle some unpaid time off. What made you choose China? My mum is Chinese but she was born and brought up in New York before moving to the UK. We never visited China growing up. A couple of years ago, my grandad died and that was the first time that I really felt a cultural connection with China. At his funeral, there were traditions that I didn’t understand and that felt unfamiliar to me. It struck me that although I don’t have relatives in China anymore and don’t speak the language, it’s still part of my identity. So, this trip was a way to begin to explore my roots. I also wanted to see whether I should invest in learning the language or spend more time there in the future. Did you have any hesitations about going? I was also apprehensive about spending that much time travelling by myself. I’d chosen to do it so was mentally prepared for it — but I was still a little worried about whether I’d meet anybody. How easy did you find it to meet other people? I met up with a friend who has just moved to Mongolia in both Beijing and Shangai, so I had plenty of company there. Most of the other people I met were locals. I think they were intrigued by the fact that I look slightly Chinese but I obviously had no idea what was going on and was by myself! I ended up spending a few days with a girl I met in a Starbucks, which was lovely. Another even took me on a tour of his town. I was a little disappointed by the hostels, though. I was hoping to meet other backpackers there like I have on every other trip, but it didn’t really happen. By the end of my trip, I just avoided them altogether and stayed in more luxurious places… I like backpacking, but I’m also not 21 anymore! In terms of beauty, the Great Wall was my absolute highlight. I often find that “must-see” attractions are disappointing and nowhere near as peaceful as the photos make it look. You have to wait for the right moment for people to move out of the way so you can take a picture. 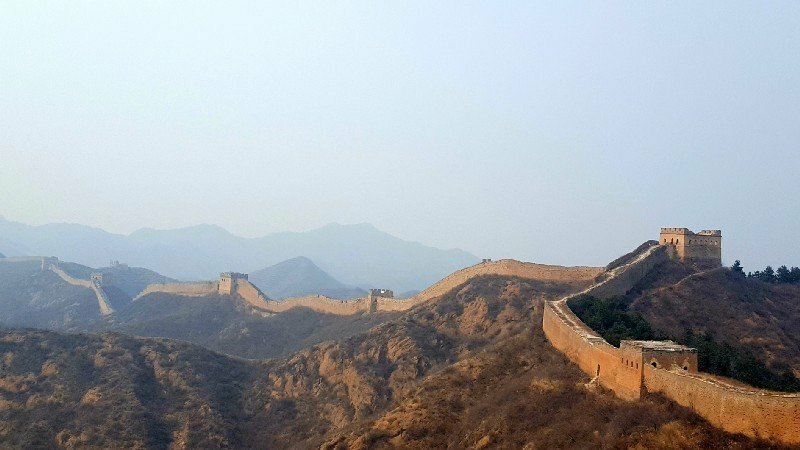 But my photos of the Great Wall reflect how truly deserted and peaceful it was once we got past the touristy entrance and out onto the wall itself. I got a real sense of the majesty of the place. Before I went people had said, “You must go, but it’s really just a big wall”. So I was prepared to be seriously underwhelmed and that just wasn’t the case. I think you get a very different experience depending on which section of the wall you visit, so I’d definitely recommend Jinshanling. Were there any other places that you really loved? Xidi and Hongcun, two ancient villages close to Mount Huangshan, were a close second favourite. They’re UNESCO world heritage sites. They’re both absolutely beautiful and incredibly atmospheric. I really felt like I’d never been somewhere like that before. It was only a day trip, but I wish I’d stayed a night and woken up early to catch the sunrise over the lake at Hongcun. I also adored the Muslim quarter in Xi’an. It has some of the feel of a Moroccan souk but at the same time it’s so distinctly Chinese. The Great Mosque there is beautiful. I’ve heard the call-to-prayer so many times on visits to other Muslim countries, but hearing it in China was a really special experience. Were there any major hiccups or challenges? Surprisingly, given that I didn’t prepare at all, most things went pretty smoothly. I was colder than expected and had to buy a couple of jumpers, that’s all! Do you think you’ll go back to China? Often when I go somewhere, I have a great time but doubt I’ll make the effort to visit again as I usually prefer to explore new places. With China, it felt different. Who knows if I felt something purely because I really wanted to? Either way, I’d love to go back. Did you learn anything new about yourself whilst you were away? I definitely gained confidence in my ability to figure things out by myself. I learned that I can rely on my own instincts. If you travel with other people, you know you can always work your way out of a pickle together. There were a few occasions during the trip when I was confused or lost, and there was nobody else to lean on. It was great to realise that after all those other times of going travelling, I’ve gained independence. How did you feel coming back home? I actually just felt really excited for further travel, especially now I’m more confident that I could go on my own again. Some of my friends are starting families and won’t be able to come with me so easily, but that won’t hold me back in future. I also got really sick just before I left China and had to endure three flights over two days. So I was far more pleased than normal to be home! 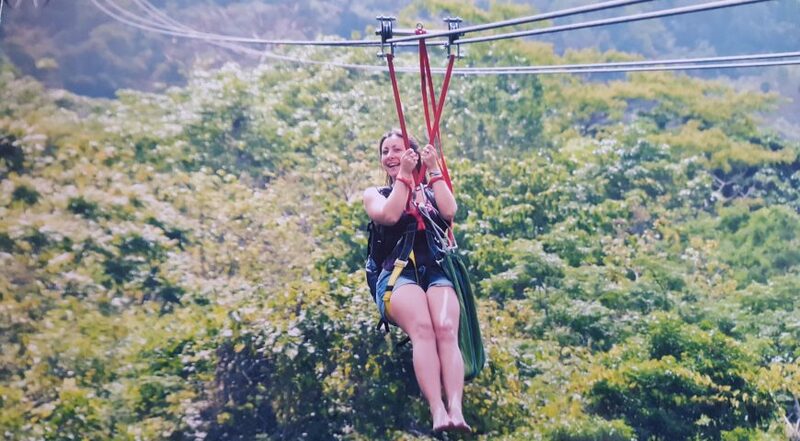 Looking back, would you do anything differently if you went travelling solo in China again? At the start of my trip, I was looking for some bargain accommodation in Hong Kong so booked a room in a hostel that sounded decent enough. Only when I arrived did I realise I’d booked the tiniest, starkest room imaginable in a place in ChungKing Mansions. (Google it!) That first night, I heard the owner having a huge row with some other travellers, so I moved out as fast as possible in the morning! My Kindle. I couldn’t have done without it, especially being by myself and spending so much time on long train journeys across the country. I read tons of books. My two favourites were The Essex Serpent by Sarah Perry and Behold the Dreamers by Imbolo Mbue. Also, my VPN app. You get so used to being able to Google things at home but that’s just not the case with the firewall in China. I hadn’t even thought about it but luckily I met a guy on the train from Hong Kong who told me and helped my download one called Betternet. Thank God he did — I used it all the time! Do you have plans to take more time out to travel in future? Oh yes, whenever I can! I ended up being offered a new job just before I went to China. It’s a step up at a larger charity closer to where I live in Brighton. I’ve only just started though, so I think I’ll wait until I’ve settled in a bit before I ask about the sabbatical policy! Has your style of travelling evolved over the past decade? The only change is probably in terms of accommodation. I stayed in some rather grotty places in Thailand, Bali and East Africa when I was younger and I prefer a little more comfort now! What is it about travelling that makes you want to go again and again? Several reasons, I think. One, because everywhere is so different and there’s so much to learn about the world. Even different places within one country often have a different character or culture. Two, I find it’s a great way to stop, evaluate my own life and find a different perspectives on things. Three, it’s just so much fun! Africa is really high up there. I spent time in East Africa a few years ago, so South Africa, West Africa, especially Ghana…. To be honest, there really aren’t many places I wouldn’t like to go to! A big thank you to Miranda for sharing her story and beautiful photographs.